The more I practice the care of foot and ankle ailments, the more I realize the importance of keeping an open mind and recognizing that no one treatment is perfect for all patients. As far as plantar fasciitis is concerned, I have come to realize that a treatment algorithm is important to set up for your practice.Over the past two years, our team of doctors has treated more than 2,000 patients with plantar fasciitis. This has allowed us to try multiple conservative and surgical options. We have concluded that certain conservative options seem to make significant improvements.If I have one conservative option to offer patients on a consistent basis that has the most impact in their recovery from heel pain, it would be Achilles and gastrocnemius stretching. We usually will ask patients to perform both calf and Achilles stretches for five minutes three times per day. We teach the patients these stretches on the initial visit.Second in line for conservative options is a close tie between physical therapy and orthotic use. We have found that the combination of stretching, physical therapy and orthotic use has helped over 80 percent of our patients recover without further need for care. The average time to recovery has been less than two months and no further treatment has been necessary in over 90 percent of this initial group. Then there are the remaining 20 percent of patients who have either severe initial pain with only a short history or chronic heel pain that has been present between six months and a year.The treatment algorithm differs for those with a short history of pain. Although there is some fluidity in the treatment options, patients with a brief history of heel pain who have not responded to orthotics and/or physical therapy and/or stretching often receive continued physical therapy in combination with steroid injection under ultrasound guidance.I give a total of two injections and these are spaced apart by two weeks to a month depending on what is necessary. What is amazing is the fact that many of the patients with a brief history of heel pain respond exceptionally well to a steroid injection and experience improvement after one to two injections. There is an inflammatory involvement. The steroid injection relieves the inflammation and allows the fascia to begin the healing process.Distinguishing Between Plantar Fasciitis And Chronic Plantar FasciosisThe second group of patients, those with chronic heel pain for more than six months, is by far the most difficult to treat. Often, they have had pain for over six months prior to presenting to us. I believe this results in chronic plantar fasciosis and not plantar fasciitis. The difference in the two terms is subtle but definite.In the aforementioned patients with plantar fasciitis, they have an inflammatory problem that responds well to anti-inflammation treatments. In the chronic plantar fasciosis group, there is a lack of inflammation and an exceptional amount of scar tissue and fibrosis. The body’s response to the chronic scar tissue and fibrosis is to give up and decrease the healing blood supply necessary for resolution.So how do we treat this last 10 percent of patients? We have found that some patients will feel better with steroid injection therapy but this is short-lived as there is no inflammatory problem.Therefore, when the steroid leaves the patient’s system, the problem returns with no improvement. In such patients, we have found that irritation of the tissue causes an increase in blood supply, breakup of the scar tissue and a fresh new micro-injury to the tissue.This allows us to take the chronic plantar fasciosis and transform the problem to acute plantar fasciitis. We can then begin to treat the transformed fasciosis as an acute plantar fasciitis.Weighing The Pros And Cons Of Treatment Options For Plantar FasciosisWhen it comes to chronic plantar fasciosis cases, the three treatments we have used with the best outcomes are radial shockwave therapy, platelet-rich plasma (PRP) therapy and Topaz Coblation (Arthrocare) therapy.The most simple and safest of these treatments is radial shockwave therapy. In our hands, we have found that the low-energy treatment option is safer and has less risk of heel trauma. Initially, we performed high energy shockwave therapy for two years. Due to the need for anesthesia and sedation, the expense and the difficulty with access to the shockwave machine, we used very high intensity levels. This resulted in contusion pain to the heel from time to time.With the low energy system, there is minimal to no need for anesthesia and the risk of heel contusion is also minimal. The downside of the low energy machine is that it usually requires three to five treatments, resulting in a longer recovery period.If pain does not resolve, the second treatment in the line is PRP therapy. With this treatment, a centrifuge spins down 60 cc of blood, resulting in 6 cc to 10 cc of platelet rich material. Under ultrasound guidance, one then injects this material in the area of greatest scar formation and damage related to the pain of plantar fasciosis. We have found that ultrasound guidance is critical for proper placement of the injection and there is an increased level of response with needling of the fascia during injection.The downsides of PRP therapy have been the need for a blood draw and the need for an injection. There is often a strong inflammatory response resulting in moderate but short-term pain.The most effective but also the most invasive of our plantar fasciosis treatment options is Topaz Coblation therapy. Sedation and local anesthesia in the operating room are necessary to perform the procedure. The physician places approximately 24 to 30 needle holes in a square pattern on the medial and central bands of the fascia in the medial calcaneal tubercle region at the area of greatest pain. One would insert the Topaz into the needle holes and fenestrate the fascia with a short burst of electric energy. This results in microscopic cutting of the fascia, increased blood supply and breakup of the scar tissue. There also seems to be an increase in strength to the fascia with this procedure.The drawbacks of this procedure are the need for surgery, the cost of surgery and the fact that scar formation from the multiple incisions may be a source of pain. Although scar formation is very rare, there is a need for additional downtime with this procedure and recovery is usually slower and more painful. What Criteria Factor Into Choosing A Treatment?Deciding which of these treatments to use is somewhat complicated. We often consider the level of damage, the duration of pain and the thickness of the fascia on ultrasound. When there is greater scarring and a longer duration of pain, the level of treatment progresses from shockwave therapy toward PRP and ultimately Topaz therapy. This is again very fluid and some patients will want to try all three options prior to any form of surgery.However, we find the shockwave therapy is not as strong and has less effective outcomes in cases of severe fibrosis in comparison to Topaz Coblation therapy. In our offices, we perform five times the number of shockwave procedures in comparison to Topaz procedures. This is mainly due to the fact that the shockwave therapy is less invasive and therefore more favorable to patients.It is not rare for us to perform two out of the three procedures (shockwave, PRP and Topaz) and, in some patients, all three procedures prior to relief. What is most interesting is that PRP may fail but shockwave therapy may work or vice versa. 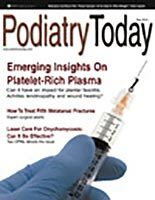 We have not performed shockwave therapy or PRP treatments in patients after the Topaz procedure and have proceeded to surgical release of the fascia if the Topaz procedure fails.Of interest is the fact that out of the 2,000 cases of plantar fascia problems that we reviewed, only 3 percent (24 patients) required surgical release of the fascia.To ensure an accurate diagnosis before fascia release, I will get a magnetic resonance image (MRI) and also consider the presence of any form of nerve complications. If there is any suspicion of possible nerve entrapment, I will pursue a workup for neuropathy and nerve compression. The use of MRI is limited but necessary in order to make sure there is not a fracture or potential cyst in the heel bone.Final NotesThere may be a need for possible fascia release in severe cases of plantar fasciosis that do not respond to any form of treatment. However, with proper procedure selection, we can facilitate excellent outcomes in the vast majority of patients with plantar fasciitis or fasciosis without resorting to plantar fascia release.Dr. Baravarian is an Assistant Clinical Professor at the UCLA School of Medicine. He is the Chief of Foot and Ankle Surgery at the Santa Monica UCLA Medical Center and Orthopedic Hospital, and is the Director of the University Foot and Ankle Institute in Los Angeles.